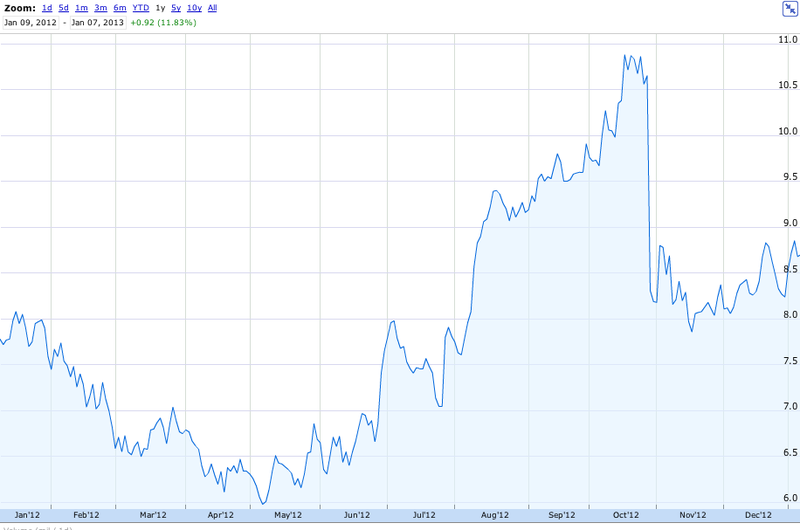 Turns out, the value of Times Co. stock has been on a roller-coaster track over the past 12 months. The company had a terrific six months, from May to October, during which the value of a share of NYTCo stock almost doubled. Somewhere around Halloween, the stock cratered, and it has been basically crawling sideways since then. So, the Times Co. experience does not fit Carr’s trend story. I would say that would be a good subject for him to take up next: why doesn’t the Times‘ journalistic excellence translate into financial success? It’s an important question to answer, because without making money, the Times will not long be able to dance or ice skate. Like other dinosaurs, it will die out. I think it’s got a lot to do with monetization. I am not sure what the sales force structure is at The Times (in Canada they are actually unionized employees of the newspapers) — but you MUST HAVE a good sales team to communicate this sort of value proposition to advertisers (OK, I realize I’m drinking the marketing Kool-Aid, here). However, in the same way that a Burberry jacket or a BMW is a premium product, so too is The Times – and its readership. Agencies buy media on metrics but also on ‘brand compatibility.’ Now that I would love to see Carr write about.